UCSC placed seventh in Sierra magazine's third annual "honor roll" of the top 10 greenest colleges in the nation. See the full report, titled "Cool Schools." "We have a broad range of initiatives that span the different areas for which one can be recognized for sustainability," said Aurora Winslade, UCSC sustainability coordinator, explaining UCSC's ranking in the top 10. "Our impressive academic programs, our leading efforts in our dining halls, our innovative transportation programs--in just about every aspect in which they evaluate campuses, we're doing something, and in many areas we're leading the way," Winslade said. That UCSC is a small, relatively young public university, without the large endowments and environmental programs of some of the other campuses on the list, makes the recognition that much more special, said Daniel Press, UCSC Environmental Studies Department chair and chair of the Chancellor's Council on Climate Change. "So when you try to mobilize a campus like UCSC around these kinds of issues, you're necessarily going to have to depend on more of the human resources and ingenuity, the street-level changes you can make, rather than such things as building a new cogeneration plant like UC San Diego did," Press said. "We're doing this with, really, a scarcity of resources. So to have that recognition, when you don't have the usual assets, I think is even better." A growing interest in green issues among college students has led two-thirds of university applicants to say that a school's environmental report card would influence whether they'd enroll, according to the magazine. The campus has retrofitted virtually all indoor lighting with compact fluorescent devices or energy-efficient T8 fluorescents. Dining Services employs 56 Energy Star-rated pieces of food service equipment, representing 40 percent of equipment in the department. UCSC participates in Hewlett-Packard's cartridge return program. H-P remakes its cartridges using spent cartridges in the material mix. The campus offers a bike shuttle, carpool and vanpool incentives, and the Zipcar program, among other transportation demand inducements. Of the three UCs that made the magazine's honor roll, UCSC ranked highest. UC Berkeley came in at No. 8, while UCLA was slotted at No. 9. To create the rankings for its "Cool Schools" story, Sierra sent a questionnaire to sustainability experts at hundreds of schools, covering the categories of efficiency, energy, food, academics, purchasing, transportation, waste management, and administration. Scores were calibrated to create a 100-point rating system. UCSC received a total of 96, scoring highest in transportation and purchasing. 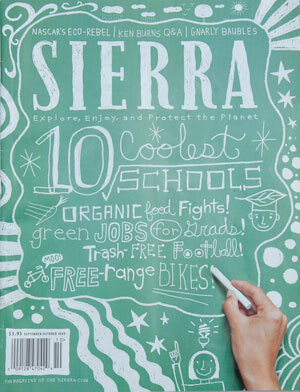 Sierra is the official magazine of the Sierra Club, the nation's oldest and largest environmental nonprofit. The publication has a readership of 1.2 million. UCSC's ranking in the Sierra magazine honor roll received coverage in the Los Angeles Times ("Sierra Club's top 20 eco-friendly colleges include 3 in California") and the Santa Cruz Sentinel ("UCSC called one of 'coolest' schools"). Note to reporters: You may contact Winslade at (831) 459-3011 or aurora@ucsc.edu, and Press at (831) 459-3263 or dpress@ucsc.edu.